If you’re thinking about leaving on holidays for Granada, you should definitely stop by the town of Almuñécar. Discover what to do in Almuñécar, and you will fall in love with this gorgeous town before even actually visiting it. The town of Almuñécar lies on the Costa Tropical in Granada province, between Almeria and Malaga. It offers numerous possibilities to enjoy oneself, and soak up the authentic atmosphere that is typical of the Andalusian towns. 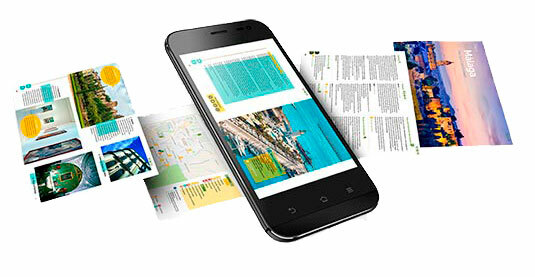 Therefore, take a look at all that you can do and see while here! The first thing you’ll need to know is how to get there. If you travel by car, take the A7 towards Motril – Almería from Malaga. Take the exit n. 305, towards the N-340/Costa/La Herradura/Almuñécar (Oeste). Follow the national road N-340 until you reach the town. If your starting point is Almeria, take the E15 towards Malaga, and then the A7. Almuñécar is also reachable via bus. The bus company ALSA provides regular service between the town and the cities of Almeria, Granada and Malaga. Almuñécar’s bus station is located in the avenue Juan Carlos I. The first traces of human passage in Almuñécar date back to 1500 BC, although the first colonisation only happened in the 9th century BC. The Romans conquered an already well-structured area six centuries later. During the Al-Ándalus times, Almuñécar belonged to the territorial division of Elvira, and it converted into the main coastal city of the Granada’s Kingdom of Taifa. It kept its importance during the Nasrid kingdom, too, until 1489, when the Coast of Granada surrendered to the Castilian Troops, and the peace was signed, you guess it, in Almuñécar. Almuñécar relies on 19 km worth of gorgeous beaches, which are a real peaceful oasis, as well as providing fun for the whole family. All of them are worth a visit, from the urbanest shores to the nudist beaches and the small coves facing awe-inspiring cliffs. Among the 26 beaches that characterise the coast of Almuñécar, the beach of San Cristóbal stands out. Located on the western side of the town, it’s one of the biggest beaches in the area. You can eat in one of the numerous restaurants that you’ll find here. 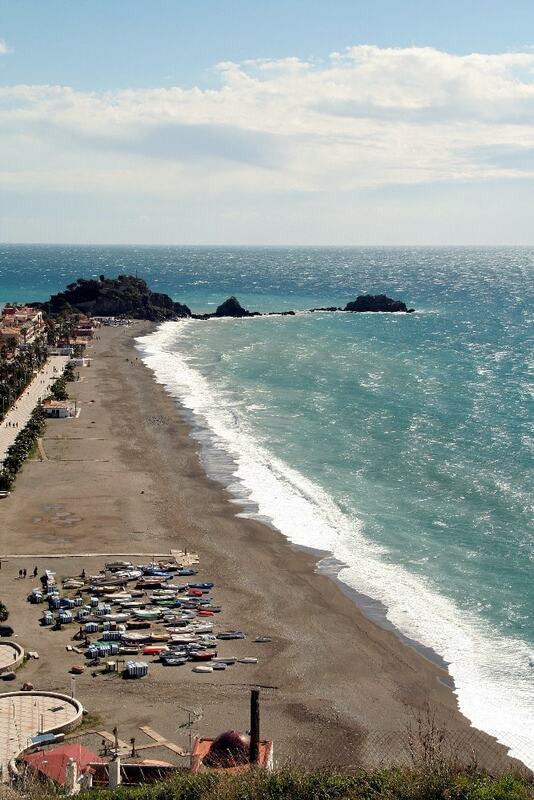 The beach of La Herradura is another worth-mentioning beach. It lies a little more than 4 km from the city centre, between two hills of rare beauty. This is an urban beach that provides all the services required by families with children. Other two beaches you can’t miss out on are the beach of Puerta del Mar and the beach of Velilla. The first one is one of the most attended, mainly because of its location in the city centre of Almuñécar, near the night bars of the area. The beach Velilla is one of the biggest shores. It’s highly demanded as it relies on a unique location that prevents strong West winds from bothering those sunbathing here. If you want to know more about the beaches in Almuñécar, and in the province of Granada, click here. If it’s true that one of the best ways to get to know a culture and a town is by tasting its cuisine, then you can’t miss out on that of Almuñécar. Its traditional gastronomy is unsurprisingly based on seafood (mainly groupers, conger eels, and red sea breams). Its dishes combine these products with those that come from the vegetable gardens that populate the area, to create delicious flavours. While here, try the seafood cooked on the grill (known as “moraga”), the “atún encebollado” (the onion-seasoned tuna fish), and the “papas con cazón” (dogfish with potatoes). Moreover, taste the “Calabaza frita” (fried pumpkin), “aguacate con gambas” (avocado with prawns) and the “sopa de ajo” (garlic soup). Besides, did you know that Almuñécar is one of the leading producers of the custard apple? In fact, another of the basic elements of its cuisine are the exotic fruits such as avocado, guava and mango. One of the best desserts to end your meals in Almuñécar is the custard apple ice cream (helado de chirimoya). If you love culture and you think the best way to really soak up a town’s atmosphere is by discovering its monuments and historic spots, then take a look at this possible itinerary of Almuñécar. If you reach the town by bus, you’ll most likely end in the bus station, located in the city’s northern area. Therefore, the first stop should be the Arch of Triumph “Paseo Blas Infante” , which is also considered the door of the city. 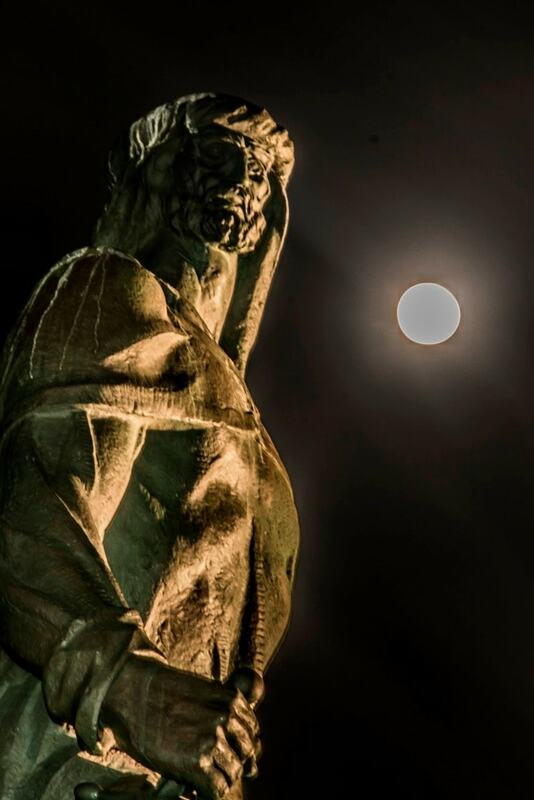 It was built to honour politician Blas Infante (known as the Father of the Andalusian Nationalism), and its three arches remind of the three cultures that have been ruling Almuñécar (Roman, Islamic, and Christian). 270 mt west of the Arch of Triumph, you’ll find the 1st-century Acueducto Romano de Sexi (Sexi’s Roman Aqueduct). Various parts of the 7-km long aqueduct can be spotted throughout the city, and it was used to bring the water of Rivers Verde and Seco (to which it owes its name) to water the tropical-fruit fields of Almuñécar. Moving south, you’ll reach the lovely historic centre of the town. Here, only 400 metres from the Aqueduct, rejoice in the beauty of the 1600 Iglesia de la Encarnación (Church of Incarnation). 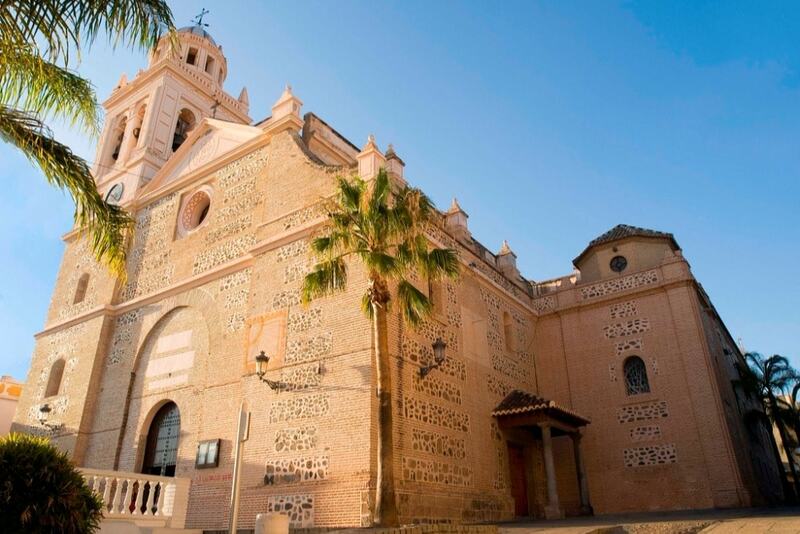 Designed by architect Juan de Herrera, this church was the first Baroque-style church in the province of Granada. The Visigoth sculpture of the Virgen de la Antigua, the patron saint of Almuñécar, is one of its most noteworthy features. You can access the church for free all week long. Another 240 metres separate you from the Archaeological Museum of Cueva de los Siete Palacios . 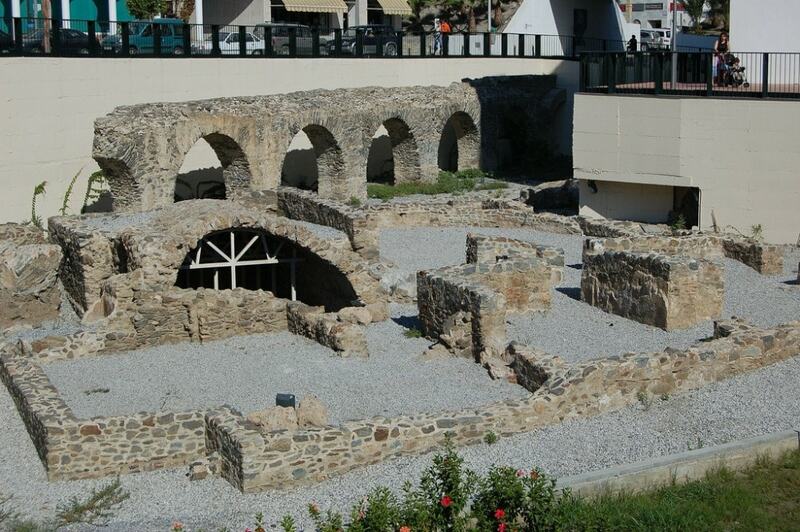 This museum lies in the basement of the ancient Roman temple of Minerva. Here, you can see various archaeological pieces, among which the 16th-century-BC Egyptian amphora that belonged to Pharaoh Apophis I. After a 3-min walk, you’ll reach the Castle of San Miguel , an Arab fortress that was re-built after the Catholic conquest of Granada. During the Independence War, he was bombed by the English troops, which reduced it to ruins. Until mid-20th century, it was used as a cemetery. 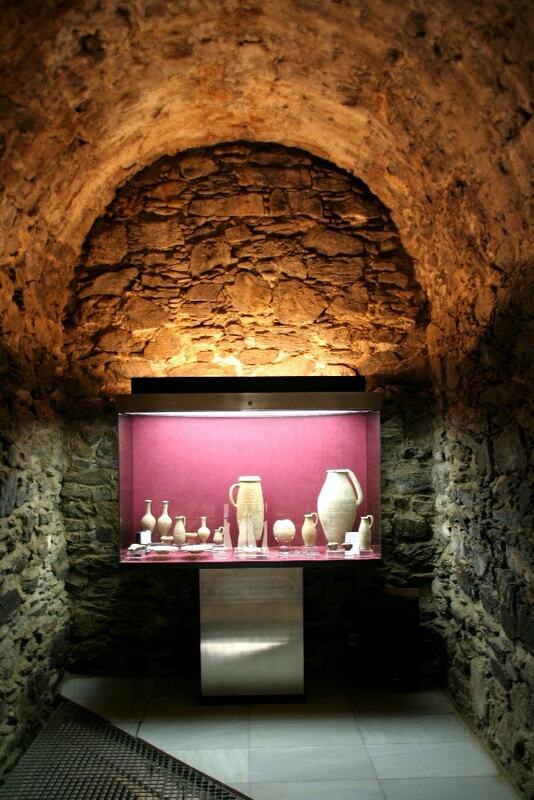 In the last ten years, the Castle has undergone a complete renovation and had various exhibition halls added to it. 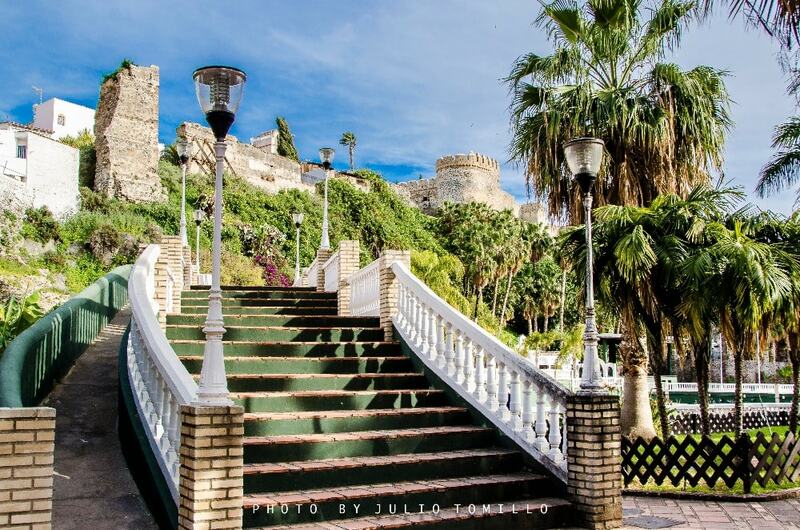 Your next stop should be the Botanical Park El Majuelo , located at the foot of the castle. The favourable climatic conditions of the area have allowed the creation of this park that welcomes species from New Zealand, Africa, the Philippines and Latin America. You can access the park for free from 8 am to 10 pm. The last stop of this tour around Almuñécar is the Monument to Abderramán I and the nearby Peñón del Santo. The monument is dedicated to the Omeyan prince and his landing on the coast of Almuñécar before the foundation of the Caliphate of Cordoba. 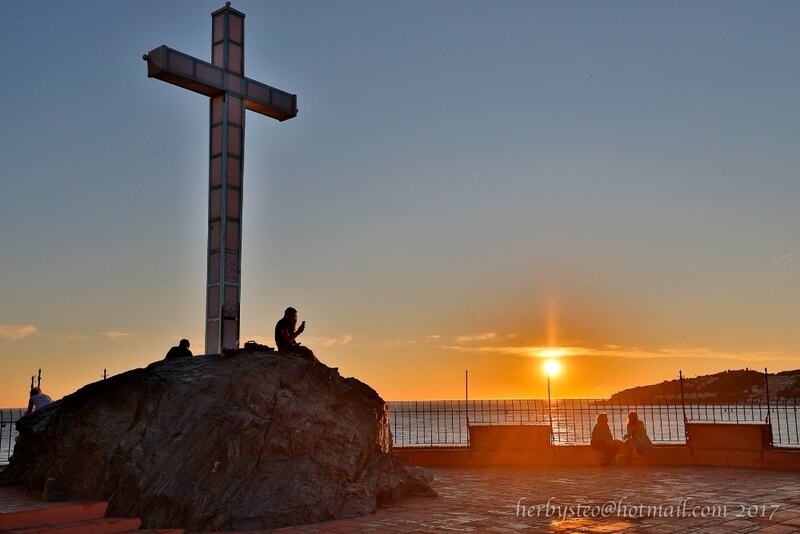 And last but not least, visit the Peñón del Santo , from which you’ll have splendid views of the town. A 1900 cross crowns the viewpoint, which offers unique vistas. The Tourist Office of Almuñécar is located in the Palacete de la Najarra, a Moorish Revival house of the 19th century, which stands out for its tiled outdoor decoration, and the indoor frescos and honeycomb works. Its garden full of cypresses and palm trees is another worth-mentioning feature of the house. Now that you know everything you can do in Almuñécar, if you want to unwind in a relaxing setting, take a look at the best holiday homes and villas in Almuñécar by clicking on the button below.